Washington is a web of rivers, tributaries, wetlands, and forests which support a seemingly endless array of wildlife species, and also the economy and population. As in any growing state, commerce, industry, and development is just as essential as the state’s natural resources. Morton, Washington is like many rural outcroppings that are tied to the economies of Seattle and Tacoma. This small town is nestled at the foothills of great Mount Rainier, surrounded by mature woodlands and wetlands adjacent to Lake Creek (which feeds the grand Tilton River). A 10-acre new construction and industrial development on the outskirts of town is home to a medical device recycling center, Stericycle. 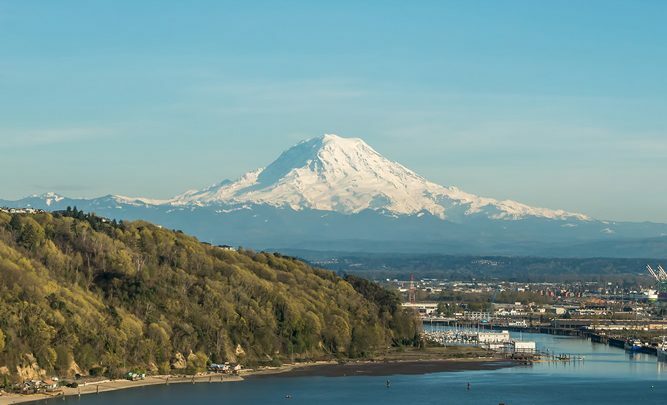 New industrial sites surrounded by Washington’s pure natural resources can be intriguing models of sustainable Low Impact Development, given the proper proven solutions. They show us how engineers and developers can successfully design stormwater systems to both achieve short and long-term economic goals and comply with the Washington State Department of Ecology’s regulations and protections. Stericycle’s new industrial recycling center is a 38,000-square foot property “serv(ing) thousands of customers throughout Washington,”1 providing waste disposal solutions and hosting an almost constant volume of trucking and delivery traffic from Olympia, Tacoma, Puyallup, Centralia, and Vancouver. Industrial related trucking generates obvious Pollutants of Concern (POCs) that will continuously collect on the newly paved parking lot and large metal-roofed building. This impervious land mass will generate stormwater runoff filled with POCs – Dissolved Metals, Total Suspended Solids (TSS), Hydrocarbons, and Nitrogen – producing high treatment flow rates. Bio Clean’s Modular Wetlands® System Linear is approved by the Washington State Department of Ecology for General Use Level Designation (GULD) for Basic (TSS), Enhanced (Heavy Metals –Zinc and Copper), and Total Phosphorous treatment regiments. This designation allows the Modular Wetlands® System to be specified as a stand-alone BMP to mitigate these pollutants. “This biofiltration system is the most reliable stormwater device under these conditions, and the Modular Wetlands® System is economical, reliable, and approved by Washington State DOE,” according to Jeff Pierce. He continues, “High treatment flow rates, in many systems, equate to high maintenance costs, but the Modular Wetlands® is the only biofilter utilizing horizontal flow, allowing for multiple stages of treatment – compartmentalizing trapped pollutants. Our client will enjoy the lower excavation and construction costs, but also long-term low maintenance benefits.”. Horizontal flow also allows for internal high-flow bypass in a Side-by-Side Orientation design, placing the pretreatment and discharge chambers adjacent to one another [As seen in Figure B]. During certain rain events, heavy downpour and water volumes can increase above the norm, causing some other systems (typical downward flow systems) to fail as they get overwhelmed – releasing concentrations of collected pollutants into downstream woodlands, lakes, and rivers. However, the Modular Wetlands® System has the unique ability to allow those flows to bypass the main biofiltration chamber internally, an essential and highly valuable feature in heavy-rain states like Washington. For this site and the City of Morton, pollutants already successfully collected by the stormwater biofiltration system will remain trapped and secure. Attempting to mitigate these challenges with typical bioswales can be costly. Basic non-proprietary bioretention systems typically need 1,795 sq. ft. per impervious acre (in this case a 17,950 square feet of space), but the Modular Wetlands® System takes up a mere 189 square feet (MWS-L 8-20 Curb Inlet Application) at a depth of 6.5 feet, designed to treat 0.4794 cubic feet per second of stormwater. 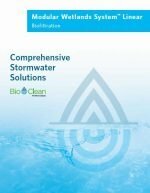 Upon design, Bio Clean’s mission was to combine nature with technology in a versatile and advanced stormwater biofiltration system. The system continues to prove itself and has been widely used in Washington, with 100s of installations. No other stormwater innovation has embraced the spirit of natural water filtration quite like the Modular Wetlands® System, sustain-ably consolidating and reproducing the power of wild wetlands for the state of Washington and the world.